Thanks for your interest in our contest! At the Bayfield Apple Company, 87540 County Highway J, in Bayfield, WI. We welcome you to come down to our orchard, explore our acres of trees, our store, our processing facility, our pond; every area of our property is open for you to photograph. Please plan to visit our orchard during the hours of 10AM - 5PM, Monday - Saturday. If you are unable to photograph during these times, and would like to photograph our orchards at a time that is more convenient to you, please contact us. The photography contest begins April 25th, 2013 and ends June 29th, 2013. All entries must be submitted or postmarked by June 29th, 2013. Photos may be mailed or submitted in person. 1. All photos taken must be taken on the property of the Bayfield Apple Company. 2. All photos must be submitted or postmarked by June 29th, and must be accompanied by a completed submission form. (A printable submission form can be found at the bottom of this page). 3. Submitted photos must be printed out, 4”x 6”. 6. Wild Card (If your photo doesn’t fit into any of the above categories, submit it in this one)! For each category, there will be a winner and an honorable mention photo. Winners will receive a $50 gift basket of products from our orchard. 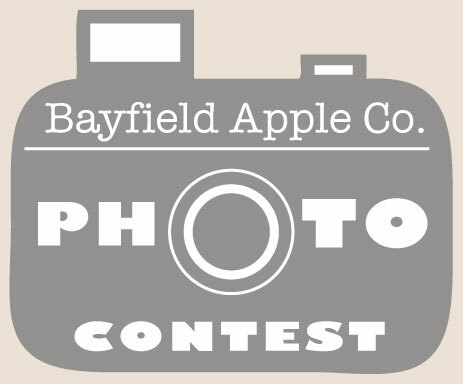 Winning photos and honorable mention photos will also be printed and on display, crediting you as the photographer, when contest winners are announced July 6th at the Bayfield Apple Company. WINNERS WILL BE CONTACTED BY JULY 1ST! GOOD LUCK!